HostGator is a web hosting powerhouse that offers extremely good values on shared web hosting, Windows hosting, virtual private servers and dedicated servers. On this page, you will see the current HostGator discounts and promotional coupons that you can use to save money before checking out. See the guide below the coupons for a walk-through and recommendations. 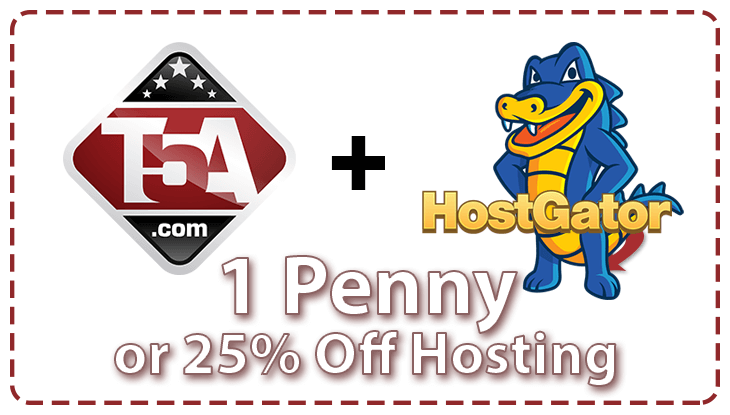 Get HostGator for a Penny! Sign up to HostGator using the coupon code t5ahgpenny and you can get the HostGator Baby plan for just 1 penny on your first month of service. This allows you to try their web hosting and see if it will work for your needs. You'll have one month to trial their customer support, hosting speed and more. Enter t5ahgpenny during checkout to activate. In this guide, we’re going to show you the exact process of claiming your HostGator coupon including our recommendations for the choices you will face during the checkout process. We offer two different coupon codes that you can use to save money on HostGator services. We will explain the differences between these codes and show you how to use them. Let’s begin shall we? 1) Want to Try HostGator for a Penny? Copy the coupon code t5ahgpenny to your clipboard then click the orange button above to be taken to the shared hosting page. From there, find the “Baby Plan,” select “Monthly” in the drop box and click the yellow “Sign Up Now!” button to continue. 2) Planning to Order for 6 Months or More? You will want to copy our coupon code t5ahgoffer to your clipboard then click the grey button to be taken to the web hosting plan selection page. Here you can choose your shared hosting plan that is best for you or click the VPS link in their menu and choose a virtual private server. Select your duration on the plan you choose and click the yellow “Sign Up Now!” button to continue. The first step of your checkout will ask you to either register a new domain or to use your own. We don’t recommend registering your domain name with HostGator because you can get a heavy discount with GoDaddy through us. Use this link to order your domain through GoDaddy for as little as $0.99. 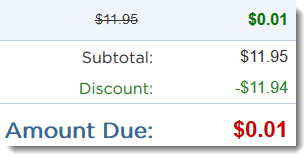 Whatever discount is offered to you by GoDaddy will undoubtedly be cheaper than HostGator. If you have your own domain already, choose the “I Already Own This Domain” tab then enter your domain name into the field. Hopefully you’ve already chosen your plan before seeing this section. Here’s your last chance to make changes to your plan and change the prepaid duration you want to pay. You’ll also be asked for a username that will be used to log in to your web hosting control panel. Lastly, enter a 4-8 digit numbers-only security PIN that will be used to get customer support. This is the easy part. Fill out your name, address and credit card / PayPal information. SiteLock – Nah, uncheck this. Most web hosts, including HostGator, already have malware and virus scanning happening on all of their servers. They need to do this to protect all of their customers as a whole. We recommend unchecking this option and allow HostGator their normal security management. Constant Contact – Leave this unchecked. For $10/mo this will subscribe you to Constant Contact email marketing service. If you are looking for a service like this, we recommend checking out our best email marketing services page for our recommendations and order directly. CodeGuard – Worth a decision. This will create daily backups to the cloud with CodeGuard. It’s like a time machine to roll back a screwup or malware attack. For the majority, uncheck this because HostGator already does their own internal backups to protect themselves against hardware malfunction. You can also use the backup option within your cPanel to download full backups whenever you want. Search Engine Visibility – Keep unchecked. This offers you the ability to get your sites indexed in search engines, however, in today’s day and age, this happens automatically. If you want to take matters into your own hands, search Google for Search Console and they will allow you to submit your site manually, for free. If you are following along, you may realize that we just had you uncheck all of their add-ons. You are observant! Kudos. Moving on. This is where you will be entering your coupon code for HostGator. Type in your code and click the “Validate” button to activate our offer. Afterwards, you will see the green check shown in the screenshot above. t5ahgpenny – Use this coupon code to take $9.94 off the Baby Plan to make it one penny for the first month. After your first month, you will pay their normal rates and can contact them to negotiate a better deal with their current offers. t5ahgoffer – Use this HostGator coupon to save 25% off any plan where you prepay for 6 months to 3 years. You will save a significant amount over their normal rates. Finally, you will see your total payment including your discount. If you are claiming the penny hosting offer, you should see what we are showing to the right with your total amount due being only $0.01. This section also shows you that your purchase is guaranteed with a 45-day money back guarantee with free support and instant account activation. You're Now Hosted with HostGator - 100% Complete! Congratulations! Wait a few minutes for HostGator to send you the details of your order in email. They will also send you important information on your new web hosting account including your selected username and will provide a password to access to your cPanel control panel. Remember to leave your review about your experience with HostGator. We want to hear how things are going for you and your new website. If you need additional help or want recommendations, consider Scott Buehler’s full suite of digital marketing services! Whether you need more leads, sales, traffic or suggestions to help your site rank better in search engines, simply use the contact link on the bottom left of this page and get in touch. Mention you ordered through this HostGator coupon page and he’ll throw in a lifetime discount on any services.